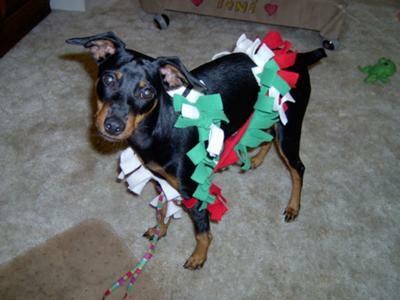 My Miniature Pinscher is just two years old, named Tobias but I call him Toby for short nick name. He is beautiful and very smart and was very easy to train. 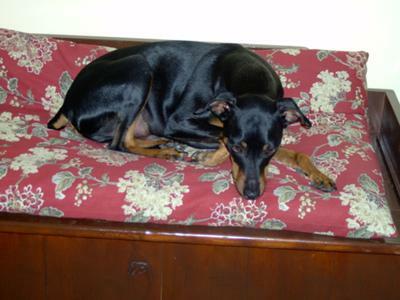 I am told by my vet that he is the longest legged min pin he has ever seen. I feed him twice a day, but think maybe I should now cut it down to once a day now that he is full grown and two years old. He is very loving and likes to sleep with me and cuddle on my lap a lot. Toby is super active in play and needs a good running exercise daily. He plays well with other dogs at a local doggy park where I take him daily. I do not use any store bought insecticides to keep flees away. Instead he gets garlic in a brewers yeast tablet once a day. He is easy to groom and loves water and taking baths. My only problem is cutting his nails for a groomer, when he was a pup, cut his nails too short making them bleed. Now he is very sensitive when his nails have to be cut. It takes two people to hold him to do the job. They have to muzzle him to do it. I make him his food at home as canned or dry dog food he seems allergic to.